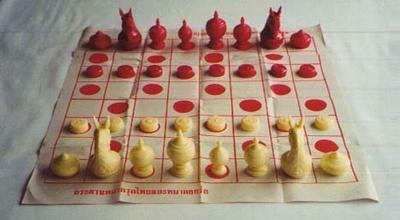 Makruk, the ancient chess of Thailand is a board game descended from the 6th century game, Chaturanga of India. There are at least 2 million people in Thailand that actually know this game. The game is believed to be at least a thousand years old, and of all the forms of chess still played today it may be closest to the original common ancestor game. The picture shows a Makruk set with a paper board. This type are readily sold in Thailand. The fact that you lack the long range diagonal moving pieces in Makruk, makes it a completely different game from the modern version of chess. According to former world class champion "Makruk is more strategic than international chess." As this is the national chess of Thailand, many of its people play this as part of their routine lifestyle, including shopkeepers, middle class people and even high elite class people. The pieces are a status symbol and in old days the upper class people usually played with ivory pieces while middle class people played with carved wood pieces. Makruk is part of Thai culture and it's a great honor to be a winner of this game. Tournaments are held in schools in Thailand as part of their activity in their academic studies. Makruk is believed to be a very strategic game and the tradition of teaching this game to their children has continued to date. This is not only a mere chess game, its an identity with which Thailand the country, Thailand the people and Thailand the culture have been evolved over the past many, many years. The impact that Makruk has on the Thai culture will prevail for many more years to come and the inspiration that this game has brought to many international cultures will continue to expand in the near future. Makruk is an ancient chess game recognized by the world of today. I think is a great game for thinking and calculating, like chess. It's more strategy than tactics because you don't have a hard queen, a powerful bishop or promotion to a hard queen, and the pawns are developed to defend. The endings need more precision than international chess because you have few movements or it's a draw under the draw rules. Join in and write your own page! It's easy to do. How? Simply click here to return to Footprint of Makruk in Thailand.